Governor Nyesom Wike of Rivers State has declared that there will be consequences, if the Peoples Democratic Party (PDP) succumbs to pressures from planted PDP presidential aspirants to move the party’s National Convention away from Port Harcourt. He further declared that the state will not support any desperate PDP presidential aspirant, who is sabotaging the economy of the state, by fighting the hosting of the party’s presidential primary in Port Harcourt. Governor Wike warned that Rivers people will teach the party a bitter lesson, if it allows planted desperate aspirants to scuttle the hosting of the primary in Port Harcourt, as agreed by leaders of the party. Speaking during a consultative visit by the Gombe State Governor and PDP presidential aspirant, Dr. Ibrahim Dankwambo, at the Government House, Port Harcourt, on Wednesday, Governor Wike said at the PDP’s national meeting, no presidential aspirant opposed Port Harcourt as a venue. He said any aspirant fighting Rivers should forget about the support of the state, during and after the National Convention. He said, “Let me warn the party, if you dare, Rivers State will teach the party a lesson. Those days have passed, when they took Rivers State for granted. Nobody can use and dump Rivers State. “Those, who are against Rivers people from making money to improve their businesses, will not get our support”. The governor said that whether the National Convention holds in Jigawa or Adamawa, the winner preferred by the delegates will emerge. “I don’t know why anyone, who wants to be president, will be afraid of a venue. Then, you are not prepared for the election. The governor pointed out that there were persons, who are not presidential materials, but have bought forms simply because the Presidency is zoned to the North. He wondered why an aspirant would declare that he is uncomfortable with Port Harcourt as a venue, but would love Rivers oil. He said, “You come here to deceive us about restructuring. Just that Rivers State is a venue, you fight it. Then, when you are there, what will happen? You think we are fools, where you preach restructuring, then when you get the position, you abandon restructuring”. Governor Wike said that at the appropriate time, he would reveal the names of aspirants allegedly working with the All Progressives Congress (APC)-led Federal Government to scuttle the primary. He added that no aspirant will use a few members of the Board of Trustees of PDP to scuttle the decision of the party to host the exercise in Port Harcourt. The governor described Governor Dankwambo as eminently qualified to contest the position of President. 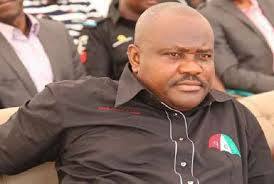 He said presidential hopeful would be considered when Rivers delegates meet to decide on who to support. Earlier, Dankwambo called on Rivers PDP delegates to support his aspiration as he has the capacity to set the country on the path of growth. He said that the crisis of development being suffered by the country was a result of the leadership vacuum at the Federal level . Dankwambo said that he has the training, exposure and experience to lead the country in the right direction, and urged Nigerians not to make the error of 2015, when they chose promises ahead of performance. He said that he would support whoever emerges as presidential candidate, should it turn out that party delegates vote in a different direction.